Since 2004, Baby Sign Language Basics has introduced hundreds of thousands of families and educators around the world to the miracle of signing with their babies—and left them wanting more! Now in this new, bigger edition, Monta Briant provides more than 300 American Sign Language (ASL) signs, illustrated with the same clear, easy-to-understand photos and descriptions. Baby-specific signing techniques, songs, and games are also included to make learning fun and open up two-way communication quickly. This book is a must-read for all parents, grandparents, and anyone else who spends time with preverbal children. After all, what parent or caregiver doesn’t want to know what their baby is trying to tell them? Start reading Baby Sign Language Basics on your Kindle in under a minute. 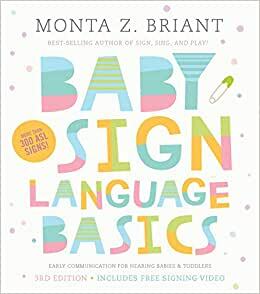 Monta Briant first discovered baby sign language when she was expecting her first child. She began signing with her daughter, Sirena, when she was 6 months old, and was so impressed with the results that she felt compelled to share what her family had learned with other parents and caregivers of young children. Monta offers classes, workshops, and storytimes throughout San Diego County. 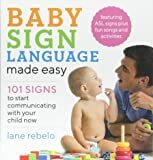 Her Baby Sign Language Basics series of products includes everything parents need for signing success, including several books, an instructional DVD, flash cards, and the Songs for Little Hands Music CD and Activity Guide. 5.0 out of 5 starsGet your baby signing! My daughter is 15 months old. I've been signing basic routine signs to her since she was 3 months old, like; milk, water, eat, snack, more, sleep. But by 12 months old my daughter had really caught on (she started signing herself at 9 months). It was such a success that I wanted to learn more signs with her. 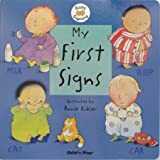 This book appealed to me the most out of the few baby sign language books here on Amazon. As soon as this arrived I cracked it open and started reading. •This book covers everything you need to know to get started and continue signing with your baby/toddler. From how to easily start signing to signing while you sing and everything in between. After I read this book all of my questions were answered. •This book is small and easy to carry with you. I alway have it in my purse or in my diaper bag. •This teaches you to introduce 3-10 signs to start and then add a few more once you feel comfortable. I carry this book with me and memorize at least two new signs a day. •Includes ASL numbers and Manual Alphabet. •More than 300 signs, each with a photo of the woman demonstrating the sign along with a simple description of how to do the sign. •Your facial expressions are important! This book taught me why the face can change the meaning of a certain signs. •This has a list of "Lifesaver Signs" such as "careful", "hot", "no" ect. Most useful section for anyone with a curious toddler. •Signing with your baby is easy. I'm a single, working mom and I love it. Once I felt comfortable signing a handful of signs the rest came easily. Now it's just a habit to sign with everything I do around my baby. •Don't expect them to catch on right away. It takes time. Even now that my baby knows 15+ signs, it still takes her a week before she will incorporate using a new sign that I've been teaching her. Other times she will start using the sign right away. •A lot of signs require precise hand shapes that young ones can't master until they're older. They will improvise to their ability of the sign. As they get older the signs will become more accurate. Overall this is a 5-star book. It's absolutely amazing and should be an essential item. It's an amazing feeling being able to communicate with your baby so early on. Finally started reading this book now that my daughter is 5 months old (and of course now that the return window has passed 🙄), and it’s missing 25 pages!!! It’s not like they were ripped out, rather it just skips from page 82 to 107. NOT COOL. Pretty good, with some oddities. With only 300 words, I'm sure hippopotamus and crab, for example, could have been omitted in favor of some more useful words, like toes. 5.0 out of 5 starsDo it! You'll be glad you did! I'd read about baby signing a little before my son was born and decided it was something I wanted to try. I bought the Baby SIgn Language Basics DVD when I did not receive it as a shower gift. I wasn't sure how it would go, especially as my husband wasn't as enthusiastic as I was about it. Around six months, I started signing "more" with my son a little, then kinda gave up because he just looked like he was too young to really be taking it in. Then, out of the blue one day, he signed "more" to me while I was feeding him! I couldn't believe it! I hadn't even been consistently using the sign, yet he had still picked up on it. This made me realize that you don't have to be religious with the signing for it to work. After that, it was much less intimidating. So we started adding a few more easy signs. Eat, milk, mommy, daddy, cookie, cracker, fruit. He picked up on it so quickly! I cannot explain how amazing it is to be able to communicate with your child before they can form words. Even after my son began "talking," we wouldn't have known what he was trying to say most of the time without the signs to go along with it. Some people worry that signing can slow speech development, but if I'm not mistaken, there's research to the contrary. In our experience, I think maybe our son was slower to begin speaking out loud, but he could still sign more words than his peers could say and in the long run I think this gave him an advantage. While "speaking" was a slower concept for him to develop, he had a head start on the concept of "communicating." I think him being able to tell us what he wanted helped us avoid some tantrums and fussing. Talking was kinda like a light bulb to him. One day, he had the confidence to start trying new words and he would say anything. By 18 months he was talking as much as his peers and had dropped most of his signs. Now that we've started signing with his 6 month old sister, he has picked up most of his signs again! My advice: Start around 6 months. Don't feel like you have to be an expert or sign constantly. You can do as much or as little as you want, but I think it makes a huge difference! This is a great, affordable resource for learning to sign to your baby. I bought the DVD before my son was born and that's all I had. The DVD is definitely the best way to learn the signs. Seeing them done by an actual person is so much easier than reading "directions" in a book. That being said, I have since bought this DVD and book combo for expecting friends and after flipping through it I was jealous and wished I had a book too. The book is a great quick reference to remind you of a sign. Whenever I forgot a sign, I had to put the DVD in and navigate the menus to find it. The book would have been a lot easier. That's why this is such a great combo! The signs they choose, for the most part are very practical. Some of them we never use enough for my son to learn (like the holidays, crab, starfish, mountain, sand, teacher) and some that I wish were there that weren't (snacks, blocks, pillow). But really, most of what we wanted was there. Plus, a bunch we never got around to teaching him. I also like that they give alternative signs on some of the important ones that are difficult for babies to do. The signs are presented alphabetically. You can watch them all in order, watch one starting letter at a time from the menu or start at a specific word. Basically, each starting letter is a "chapter" on the DVD, and the starting letter sign list is the "scene selection." It would have been nice to have an additional menu, where I could view the signs in groups (animals, foods, colors, actions, objects, feelings, commands), but I realize this would have been pretty complicated to organize on the DVD. I actually typed out the entire list in excel and grouped them by category so that I could learn them that way. I thought it was easier to learn them by category instead of alphabetically, as many of the same types of words have similar signs. 81 people found this helpful.